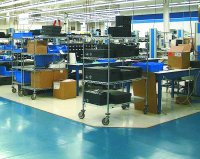 This decision led to an evaluation of ESD protective flooring. In 1998, 20,000 square feet of conductive floor tile were installed in the main production area. To help brighten the area, white tile was selected. The floor resistance measured less than 1.0 × 106 W.
At this same time, we wanted to evaluate and improve the ESD program. Kimco, our ESD control supplier, recommended that SCS provide an ESD survey, which it does at no charge. Preserve the electrical properties of the floor. Improve the visual characteristics to look clean, bright, and shiny. Reduce the floor maintenance costs. SCS suggested a high-end dissipative floor finish, assuring us that a specific ESD floor finish would improve the gloss, reduce costs, and not damage the electrical properties of the floor. We were very skeptical, especially since the tile manufacturer had always told us that conductive tile should not be waxed. Because of our skepticism, we obtained a sample of the floor finish and tested it on about 9 square feet. The test confirmed that the electrical properties of the floor had not been compromised and that the area protected with the dissipative floor finish maintained a shine much better than unprotected areas. It was now time for a test on the entire floor. In early 2000, our floor maintenance company put down the recommended initial three coats of the floor finish over a weekend. The floor looked beautiful. But within two weeks, it started to take on a yellow look. We contacted SCS, which responded immediately by sending a regional sales manager to see the floor and a product manager to review the process with the maintenance company. The cause: the mops. While dedicated mops were used, they were brand new cotton mops and not properly rinsed prior to being used, a common problem. Also, the initial application was too thick. The maintenance people thought if one gallon per 2,000 square feet was good, one gallon per 1,200 square feet would be better. The floor was stripped and the dissipative floor finish reapplied. This time, we had shiny, mirror-finish floors. Three months later, we still had a shiny floor that measured between 4 × 105 W in low traffic areas to 7 × 106 W in high traffic areas. These measurements are well within the recommended minimum performance specifications of the ESD Association’s ANSI/ESD S20.20 and Flooring Standard ESD STM7.1 for floors and ESD STM97.1 governing floors used for the primary grounding of mobile people. The resistance from the floor to people using heel grounders is well under 35 MW. Additionally, charge generation is well below 100 V in accordance with ESD STM97.2. The electrical properties were not compromised. Tribocharging on all personnel also has been reduced to less than 100 V.
The floors are clean and shiny. Black scuffmarks are more easily removed, often with damp mopping. Maintenance costs have been reduced, saving more than 40% or about $12,000 per year. As a result, all the hard floors now are covered with Statguard Static-Dissipative Floor Finish, improving ESD control throughout the entire plant including R&D and design. All contents © 2002 Nelson Publishing Inc.